St. John’s Episcopal Church is south from the library. 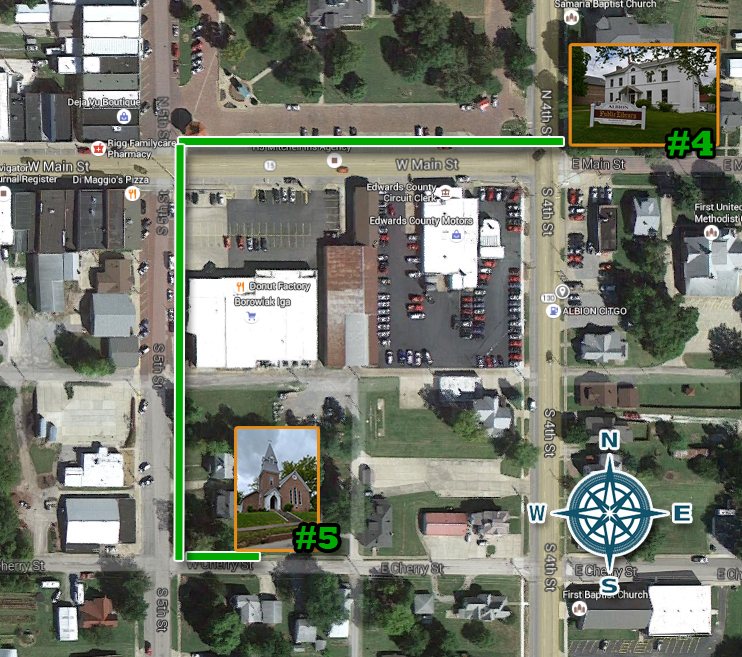 The best and easiest way to reach the church, which is listed on the National Registry of Historic Buildings, is to retrace your path to the intersection of Main and Fifth. 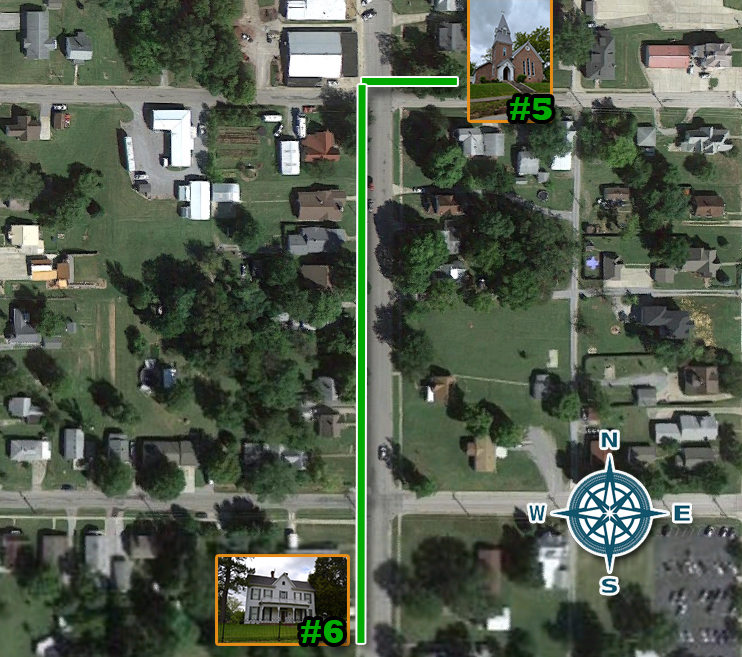 Before crossing Fifth, however, turn left (south) and travel one block south to Cherry Street. Turn left, the church will appear in your left. Albion founders George and Elizabeth Flower, both Episcopalians, donated the land for the church. The cornerstone was laid in September, 1842. The early settlers did their own masonry and carpentry. The bricks were produced in local kilns. The sandstones for the foundation were dug locally and hauled to the site. The lumber, primarily walnut, was cut from area timber. 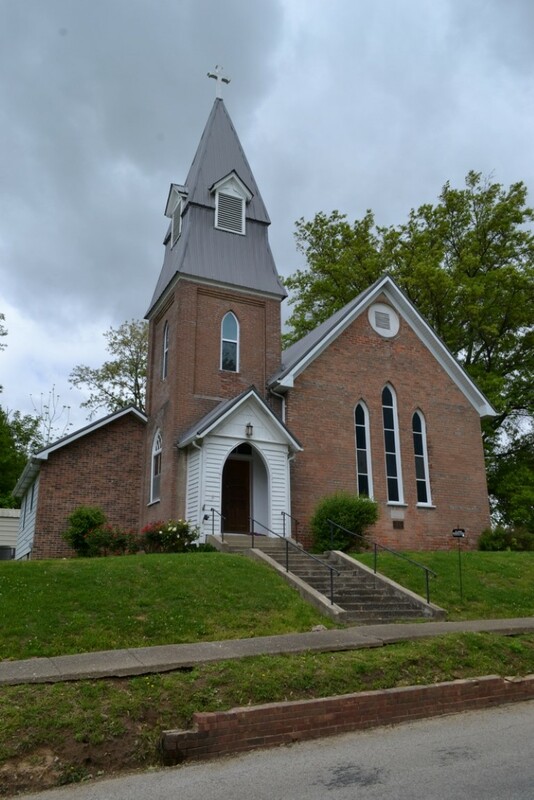 The congregation raised funds for the construction by preparing community chicken pot pie suppers, holding bazaars, presenting cantatas, tacking carpet rugs, carding wool, quilting, and making children’s clothing. The first services were held on Christmas Day, 1842, with the official consecration in July, 1843 when Bishop Philander Chase made the long, difficult journey from Peoria. Hutchins was a missionary on the frontier, but he was well educated and well read. His design reflects several features of the Gothic Revival architectural style. The Gothic Revival style was based upon English country churches of the era. The simplicity and lack of fancy ornament were designed to enhance worship, reduce worldly distractions, and create a beautiful, sacred space. The key feature is the pointed arch with inset tracery which is most obvious in the large sanctuary windows. The nine large windows on the east and west walls have the classic Gothic Revival curved, cut‐glass panes and wooden tracery trimming the top of each arch. Initially each double sash window held small square clear panes. The front entrance was originally in the center of the south wall facing Cherry Street. Its double doors were topped with a large, elegant arch filled with a graceful wooden tracery and multiple curved panes.. A modest belfry capped the roof. The bell was purchased for $38, shipped from St. Louis, and has rung for Sunday morning services since 1844. A small sacristy or vestments room was added to the northeast intersection of the sanctuary and vestry, probably during the 1870s. Father Hutchison, though elderly and retired, was still attending St. John’s in 1890 when the building was remodeled into its present style. Many of the original Gothic Revival pieces were reused. The old central doorway was bricked in and slim lancet windows installed in the south and north walls. The original walnut doors were reset in the new bell tower entrance. The original large arch over the double doors was moved inside. The interior wall between the vestry and the sanctuary was removed and a large brick and concrete arch was constructed. The altar was then moved into the old vestry area. The classic Gothic Revival timber roof beams of the vaulted ceiling were uncovered. The clear glass in the original windows was replaced by larger, colored panes. However, the curved, tinted glass pieces at the top of each window arch are from 1842. The changes added even more elements of the Gothic Revival design. Shortly after the church’s rededication, the venerable Benjamin Hutchins died. He had “spared not himself, spending and being spent in the care of the church.” The most recent changes at St. John’s are the engraved name stone inserted in 1936, the modest parish hall built in 1985, and colored glass installed in the three north lancet windows in 1999.
morning services which begin at 9 a.m.